As much as I love to entertain, and don't mind spending time preparing for large parties, intimate gatherings, or even the impromptu drop bys (I've overheard friends say "if you just randomly show up at Wendy and Alex's house, you still get a spread of cheese, appetizers, and wine! 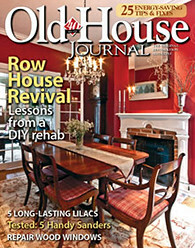 ), I'm always looking for new recipes to try out when I'm pinched for time. It's great to have an arsenal of ideas that are delicious, crowd pleasing, and ready in a snap. That's why when I discovered bite sized brie and fruit preserves in phyllo cups, I could barely contain my excitement. I'll use the term "recipe" loosely in this instance, as it's more of an assembly of ingredients. But this bite sized morsel is elegant enough for fancy occasions, and has even served me well on a Friday night with a few friends. I was first introduced to it by my baby shower co-hostess, and have been in love ever since. 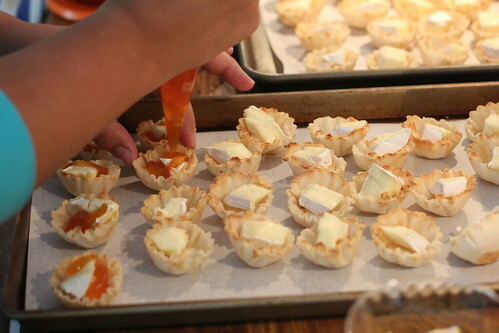 Get started by opening the boxes of phyllo cups, removing the plastic packaging. How's that for a super easy first step? Place the phyllo cups on a baking sheet. If desired, you can line the baking sheet with parchment paper, but this is an optional step. 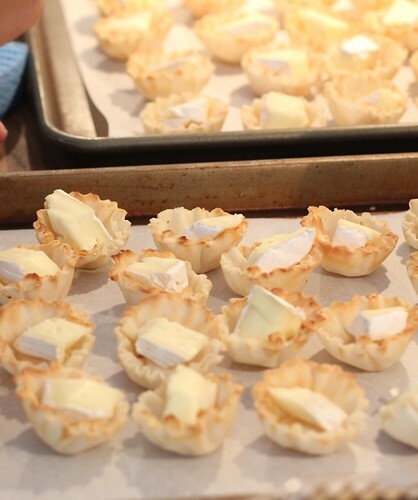 Cut your wedge of brie into small bite sized pieces, just small enough to fit inside the phyllo cups. It's easiest to use the sides of the brie as a guide and cut diamond shapes, like you're making a harlequin pattern in the brie. Next we work on the filling. 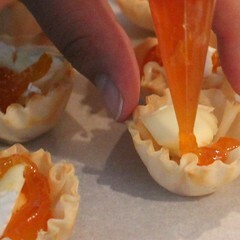 Using either a disposable pastry bag, ziplock bag with the corner cut off, or the super simple technique of a small spoon, squeeze or dollop roughly one teaspoon of fruit preserves into the phyllo cups, on and around the cheese. In this case apricot preserves were used, but strawberry, raspberry, or fig would also be a lovely option. I could even see using something like apple butter. So many delicious options. After each cup is filled, bake the brie bites according to package directions until the shells are golden brown, and the cheese just begins to melt. Roughly 10 minutes tends to work well for me. Presentation is quite simple as well. Just arrange these appetizers on a serving platter...that is if you can exercise enough self control to not eat them directly off the baking sheet. 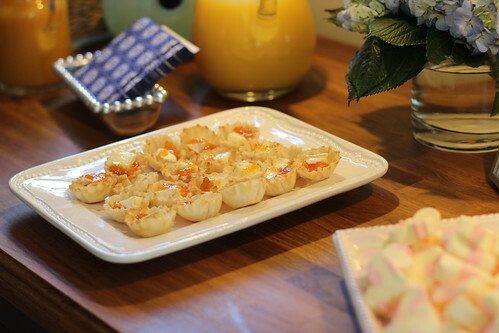 These one-bite bits of heaven were a huge hit at last month's big baby shower. Not only were they gone in a flash, but as the party was wrapping up, guests were asking if we had another tray stashed somewhere. I can't think of a more flattering question. Do you have a simple and easy go-to recipe when you entertain? Maybe something that takes just a few minutes to make, or has just a few ingredients? I was so happy to discover this appetizer, and am always looking for new ways to make entertaining a fun, yet simple endeavor. Oh mama, yum! Brie is such an easy but fancy appetizer. Try some with roasted garlic, too. So good. Mmm. I love roasted garlic. Thanks for the reminder, it's been ages since I've made it at home! Well, now what I was planning on eating for lunch if completely unappealing. I can't wait to make these! I imagine them with pear? Pear and brie go together, right? I'm hopeless. I hear you, Ashley. Brie totally beats the lean cuisine I had for lunch today! Pears is a wonderful suggestion. Baked pears and brie?? There has to be a recipe for that, right? Thanks - I am always looking for easy app recipes. These look so good! You're welcome, and glad to help. :-) They're so delicious! Those sound great! I love brie and different fruit preserves together. My favorite quick and easy appetizer is what I have begun calling "a cup, a cup and a can" You use 1c of grated Parmesan cheese, 1 cup of mayo and one can or brine packed artichoke hearts (5-7 count well drained) Combine all for the above in a food processor, pulse several times until blended. Place in a small casserole dish (about 5" x 7") and sprinkle lightly w/ paprika. Bake @ 350 for 15-20 mins. Pat any oils that may appear around the edge and serve warm w/ crostini. Everyone seems to like it and I hope you do too! Yum! Thanks for the tip, Deb. I can't wait to give this one a try! Sounds yummy! Would jalapeno pepper jelly work? It is sweet with just a little bit of hot. It was a gift (homemade by a friend) and I get tired of using it with cream cheese on crackers. Oh my gosh, I bet that would be amazing. I LOVE jalapeños and heat, and imagine this would be divine with the creaminess of the brie. Thanks, Cheryl! these look delicious! i'm a big fan of baked brie with cranberry sauce (the kind w/ the whole berries) in the fall - i can see that being a good combo here, too. Oooh, you're totally right Gretchen. That could be such a fun fall twist on this appetizer. Along those same lines, I bet lingonberry preserves would be great too! My favorite app is super easy to whip up the night before a party. Basically, in a pie or tart dish you just layer the following: enough crumbled goat cheese to cover the bottom of the dish, some olive oil, a few cloves of crushed garlic, chopped sundried tomatoes, sliced kalamata olives, chopped basil, chopped italian parsley, and a little bit of crushed red pepper flakes and chopped rosemary on top. Cover and refrigerate overnight to let the flavors meld (necessary) and then let it come to room temp before serving. I serve with a sliced baguette, but crackers work too. People always rave about it, but on the rare occasion there are leftovers, they're great in an omelet. Wow, that sounds delicious! This will be perfect especially for summer, when I have more basil in our garden than I know what to do with. Thanks, Heidi! I've used pepper jelly and needed to make another batch...delicious! I cut puff pastry to fit into mini cupcake tins. I like the flakiness more than the prepared tart shells. This gives me a great idea for my next party. Sort of like those baked brie in puff pastry wraps, but individually sized. What a great idea! I used wonton wrappers recently in mini cupcake tins and it was really good and really easy -- I imagine the puff pastry would be similar. Do you have a size that you'd recommend? I made these and everyone loved them!! I made them just how the recipe said and used apricot preserves, I will make them again!! These look great! I am having a cocktail party with around 100 guest. I need easy small bites! How long in advance could I make these and have them sitting out? Are they still good room temp??? Yes, they're definitely still good at room temp! I think you could probably have them ready 30 minutes or so before the party started. 100? That's a big party! Good luck and I hope it's a blast! These look so good and so easy! A friend just brought over homemade strawberry/raspberry jam and I was looking for an appetizer that I could incorporate the jam into. Perfect! Can you serve these cold after they have been baked?